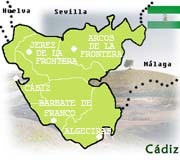 Planning a dream holiday to Cadiz City, Spain? Do you want to know all about Cádiz – where to go and what to see? Then you have come to the right place! What Cádiz is your in-depth and up-to-date guide to the oldest city in Europe. What Cádiz offers you not just practical tips, but a whole world of information that will make traveling Cádiz, Spain an unforgettable and thoroughly enjoyable experience. Here are 6 easy-to-navigate sections to find out what’s up in Cádiz, Spain. Learn hereThe History of Cádiz, from the early Roman settlements of Gadir to the lively and busy streets of "The silver teacup". The weather of Cádiz is a tourist dream: warm temperatures all year round, sun, beaches and the Atlantic breeze generate a unique climate that doesn't peak as in other southern Spanish cities and offers the visitor a much milder and comfortable temperature. Whoever visits Cádiz will hopelessly fall for its charms and unique atmosphere: a pure white sunlight bathes the city and makes it shine like silver -thus its name-, while local fishermen bring their product to the market, while the flamenco music, the finest local food and recipes and a warm sea breeze welcome you! The music culture in Mexico is rich and varied, and it makes the best complement to a great night out in the city. The music culture in Cádiz is a fundamental aspect of the cities life and identity, having given such stars as Camarón de la Isla or Paco de Lucía. Experience the magic of flamenco on a night out in the city. .
We want to give you an in-detail guide that describes all the aspects of the city of Cádiz, giving you tips about what to do. You will find every fact you wish to know from the moment you are arranging your trip to the moment you set foot on this incredible and enthralling Spanish city. With this practical travel guide you will learn all you need to know about the must-see visits, at the same time as you gather insight on the customs, traditions, and social activities of the people of Cádiz.